Our boxer, Jack is a member of our family so we like to provide him with the highest quality pet food. I recently discovered The Honest Kitchen line of pet foods and fell in love with the concept. The Honest Kitchen takes great pride in using human-grade whole foods from trusted suppliers and then dehydrating it gently to keep the ingredients as close as possible to the natural state. In fact, the pet food will expand “up to 4 times its original weight” when moisture is added so that a 10lb box of Honest Kitchen Food equals a whopping 41lbs of fresh whole food ingredients! I was very surprised with how much pet food I was able to make from just a 4lb box and this nutrient packed bounty certainly beats the huge bag of dry dog food that takes up a lot of space in our cabinet. I was originally interested in trying this product when I learned that they do not use ANY ingredients from China (remembering the recent pet food scare terrifies me) and the pet food is made in the United States in a human food facility as opposed to a pet food factory! Stacie and I both love boxer breeds and I thought you might enjoy watching this adorable video clip featuring a boxer named “Blue” who is discovering The Honest Kitchen. The Honest Kitchen provides a complete and balanced diet for your dog or cat and it must taste absolutely delicious because Jack gets very excited at meal time and the food disappears quickly! You can choose the best pet food to meet your dog or cats needs by reviewing the ingredients in each recipe formula. 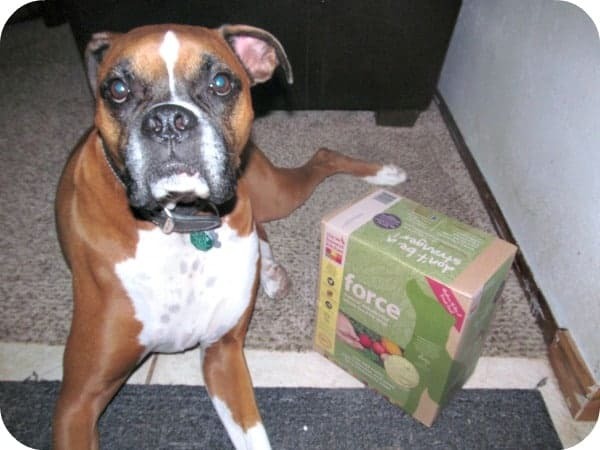 For example, “Force” dog food has dehydrated free-range chicken, organic flaxseed, potatoes, apples, organic alfalfa, organic kelp, honey, pumpkin, green beans, cabbage, bananas, papayas, basil, garlic and rosemary…..sounds delicious doesn’t it?! In addition to the dog and cat food line, The Honest Kitchen also has a wonderful selection of Gourmet Treats and even teas and supplements. I would love to have Jack try the “Lithe tea™” which is designed to help mobility as he is getting older. You are invited to visit The Honest Kitchen to browse the entire selection of products and shop for your pet’s favorite whole foods and treats. You can use the store locator or shop for all of The Honest Kitchen products from the comfort of your home online too! I definitely think my dog would like the Smooches treats. My dog would like Thrive. I would like to get my dogs the Embark line. I would like to try the “Grace” food for my cat Jasmine..I like that it is grain-free & has wholesome ingredients/veggies .. thank you .. I have a boxer/american bulldog mix and would love for her to try the Embark. It sounds so healthy and more like the natural diet of a dog. The ice pups r nice. It is human-grade pet foods !! How cool is that! I love that they offer Trial Size Boxes!! My dogs would love the Duck & Cherry Cookies for Fussy Pups – Nuzzles Treats. Pansy the pug would love the Zeal dog food. My dogs would like the Beams. They love to chew. I’m sure Banshee would love Thrive. Chicken has always been her favorite meat and this I could feel good about giving it to her. The Zeal food. I like that it’s grain free!!! I want the Love dog food because my dogs don’t let dry food but this is dry food where you add water, genius! I love the fact that the ingredients are tested before they even enter the plant…and are required to be certified organic or free range…very cool. I also like how they have FDA inspections…what great attention to quality! I have been feeding my pets homemade pet food for the last few years…but it can be time consuming and expensive to buy the extra vitamins that I put in there…this would be a welcome change! My dog would like the Nuzzles dog treats. I know my dog would love ice pups. How unique! Can’t wait to try the Force dog food for my 5 dogs. I learned that they use human grade ingredients! I’d like to try the Zeal for my dog. I feed our dog a combination of raw and dehydrated food. It is very expensive but they LOVE it and both are much better for health. Also all of their skin problem are completely gone. Using food coupon you can save your money. I would love to try your treats..I have two dogs and they are alittle on the chubby side and all the treats seem to be loaded with fillers. It is human grade food made for dogs. My babies would love the ice pups! My friend’s dog would probably like the Smooches treats! Their human-grade pet foods are made from the most pristine, human-edible healthy produce and meats available. I would LOVE to try the Quiet Tea. Our chihuahua/rat terrier mix is extremely neurotic and her skin actually turns bright red when she is stressed out.